If you have never suffered from allergies, you are not familiar with the running nose, itchy eyes and sore throat that can come with it. 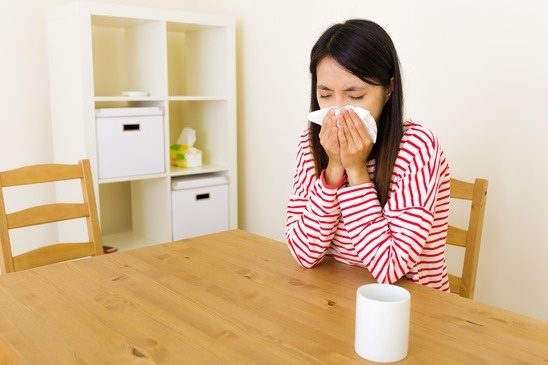 To a non-allergy sufferer, the flooring in your home may come as an afterthought. But for those who are affected by allergies, flooring takes on a whole new meaning. How do Carpets Stand up to Allergies? One of the worst offenders in allergy magnets for your home is carpeting. If your home has wall-to-wall carpet and you are living with someone suffering from allergies, you could be inadvertently making their allergies or asthma worse. Even with daily vacuuming, carpets can pick up and hold more dust and allergens than a hardwood or laminate floor. Each carpet loop can lock in dust, allergens and animal hair that can trigger allergies. In addition to trapping the allergens, when you walk on the carpet, vacuum, or disturb the carpet in any way, you could be sending more allergens back into the air. Because of this, most physicians recommend that people with severe allergies or asthma get their wall-to-wall carpeting removed. Hardwood and Other Floors: The Better Floor Option for Allergy Sufferers? While carpet is an obvious aggravator of allergies, there are many other flooring finishes that are not ideal for the people who suffer from allergies. Cork Floors – While cork floors offer easy cleanup and can be visually beautiful, the porous nature of the material creates small pockets that dust and pet dander can hide. Bamboo Floors – Touted as one of the most allergy friendly floors, bamboo floors can work well for allergy sufferers. However one thing to make sure of when considering bamboo floors is the manufacturing process. Many bamboo floors can contain VOC’s (volatile organic compounds) and can actually be worse for your health, so make sure you know what you’re getting before you buy it. Porcelain and Ceramic Floors – Both beautiful and functional, ceramic tile is relatively low risk for allergy sufferers. One thing to ensure when installing porcelain or ceramic floors is that the grouting is done properly to prevent moisture and mold from growing between the tiles. Hardwood – As one of the most desirable types of flooring, hardwood is the best flooring to prevent allergy flare-ups. The hard surface of the floor leaves no spaces or pores for allergens to hide, and with regular sweeping, dusting and washing; it can be kept clean easily. How Do Your Floors Stack Up? Whether it’s you who suffers from allergies or a family member, consider your flooring the next time you reach for the tissue box to handle pesky allergies.